After my CSA pick up, I love the challenge of coming up with a recipe that combines seasonal flavors from the local harvest -- last week's recipe was Farro Risotto with Roasted Delicata Squash and Spinach. Farro can be tricky to cook with -- as cooking times vary greatly depending if the farro has been pearled-- and certainly risotto is for the patient chef. If you're up for a challenge and have an hour to spend in the kitchen, this recipe makes for a hearty and delicious meal. The good news is that farro does not absorb liquid as quickly as Arborio rice so you don't need to stand over the stove and stir constantly, but it does take longer for farro to absorb liquid and cook to the desired and slightly chewy "al dente" bite. What I love about delicata squash is not only its beautiful color and intense flavor but the fact that the skin is thin and, unlike all other winter squashes, you can eat the outer skin (no peeling required! ).Be sure to save the seeds -- they are lovely roasted. I used a local sunflower oil from upstate New York for roasting the delicata squash. And, toasted the farro before adding any liquid with the gently cooked onions which were sauteed in sunflower oil also. Red wine adds color and rich flavor to this Fall meal. 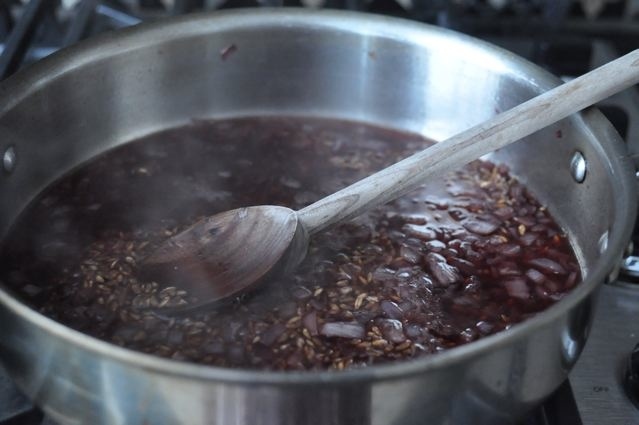 I cooked the farro in red wine and water for about 20 minutes which gave it a bold intensity. After the wine has been absorbed, add the chicken stock. I keep homemade chicken stock in the freezer but a good quality canned stock or homemade from your local grocer will be just fine. For a vegan option, use vegetable stock. A few tablespoons of soymilk at the end of the cooking adds the creaminess to the dish that you get with an Arborio rice risotto but without a lot of extra calories. 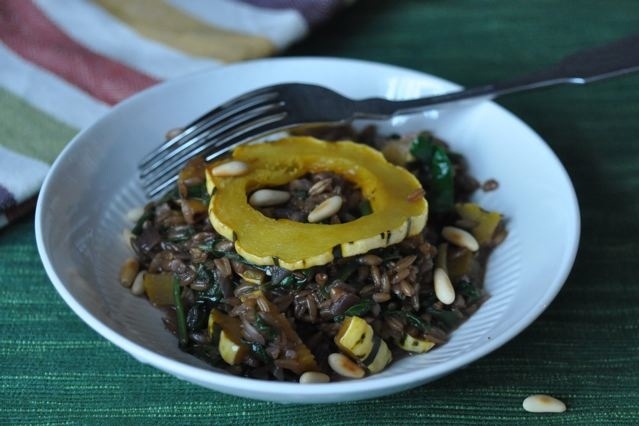 Remember to save several rounds of delicata squash to put on top of the farro risotto and add toasted pine nuts for crunch. Preheat oven to 400 degrees (F). 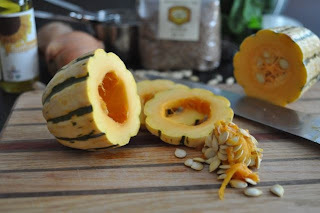 Slice Delicata squash into 1/4 rounds and remove seeds (save to make roasted squash seeds). 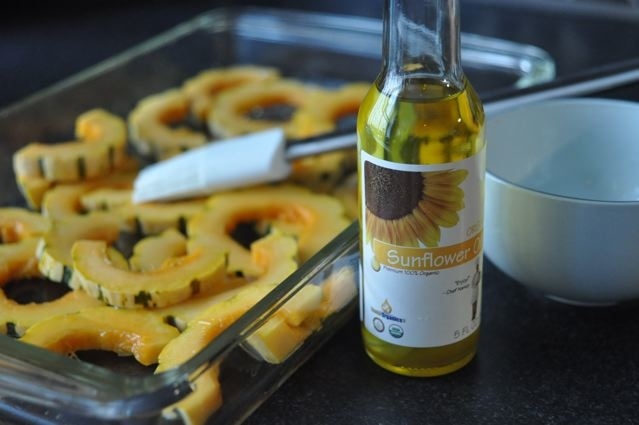 In a single layer, put the squash in a roasting pan and lightly brush with olive oil. Roast for 18 minutes on one side, turn over the sqaush and roast another 7 minutes until soft. When cooled, diced all but four rounds of the squash into 1/2 inch pieces (the 4 reserved rounds will be used to for garnish). Rinse the spinach in a pot of water, throw out the water and rinse again in fresh water. Repeat until the water is clear. Dry with paper towels or in a salad spinner. Shred into bite size pieces and set aside. Toast the pine nuts in a sauce pan over medium heat for 5 minutes being sure to shake the pan every few minutes to brown all sides of the nuts. Set aside. In a large saucepan with a lid, heat olive oil over medium heat and saute onions for 6 minutes until translucent. 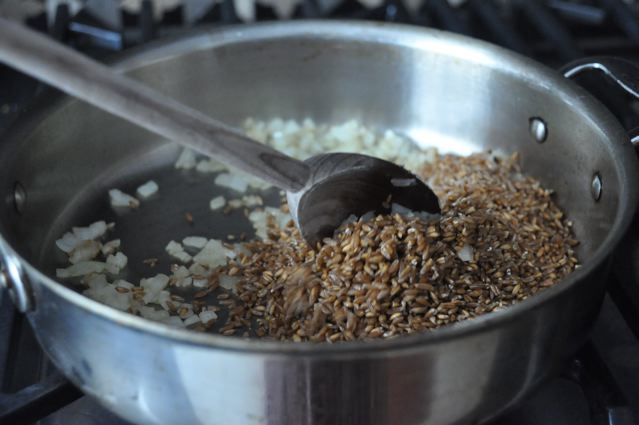 Add farro to the onions, and stir to toast. Reduce flame to low and add red wine and water and simmer for 20 minutes. Increase heat to medium and add one cup of the chicken broth. When the liquid has been absorbed, or in about 15 minutes, add another cup of chicken broth. After 20 more minutes, taste the farro for doneness -- it should be al dente with a chewy bite similar to pasta and tender enough to eat. If not, add 1/2 cup more chicken stock, stir and taste after another 10 minutes or so. 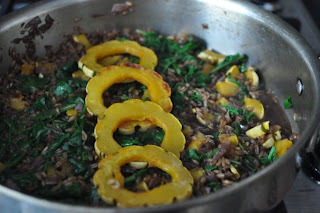 When the farro is cooked through, add diced squash pieces and stir in the spinach, and nutmeg. Place 4 rounds on top and cover just enough time to heat the squash and wilt the spinach. When everything is heated through, add 1-3 tablespoons of soymilk or heavy cream, as needed, to give it creaminess. Garnish with pine nuts and a round of squash.